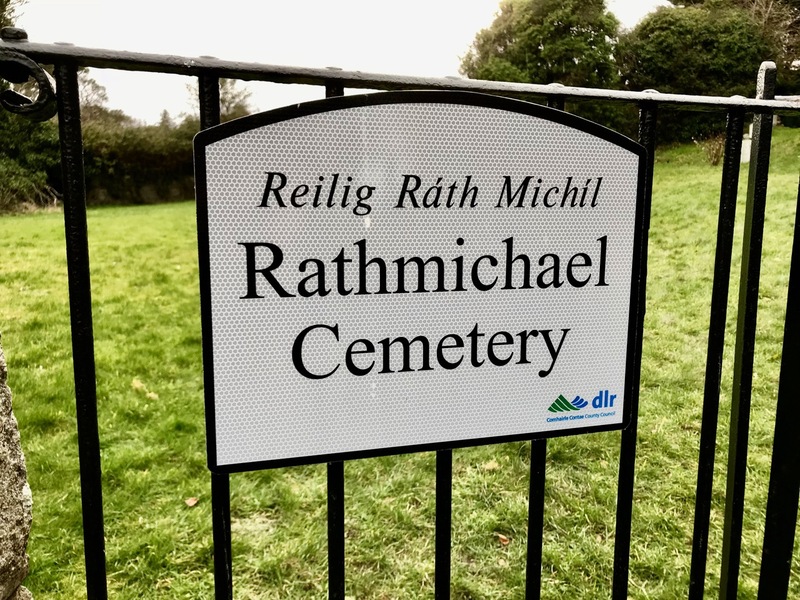 In our recent journeys around Ireland we both had opportunities to indulge our particular interests. 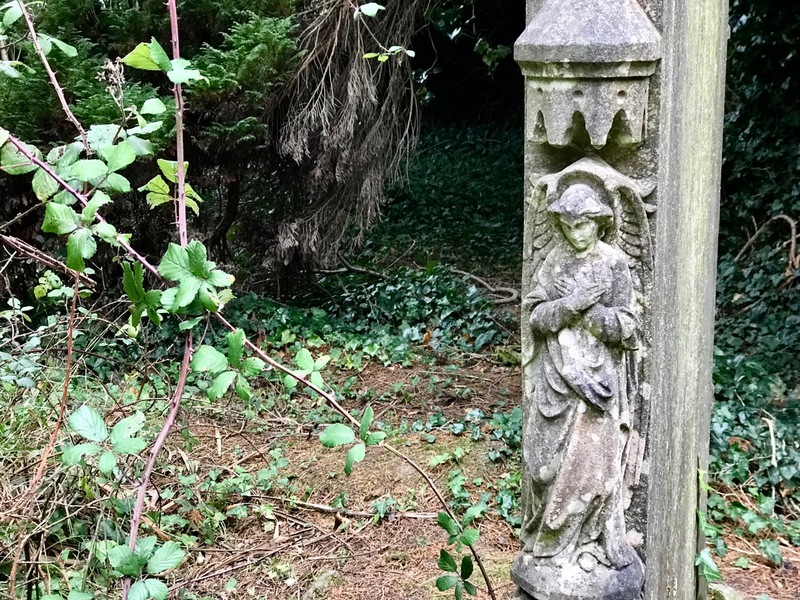 Among them, Finola was able to take in some fine examples of stained glass and Romanesque architecture, while I concentrated on the beautiful medieval carving of a number of Irish High Crosses, to add to the examples I have written about recently. 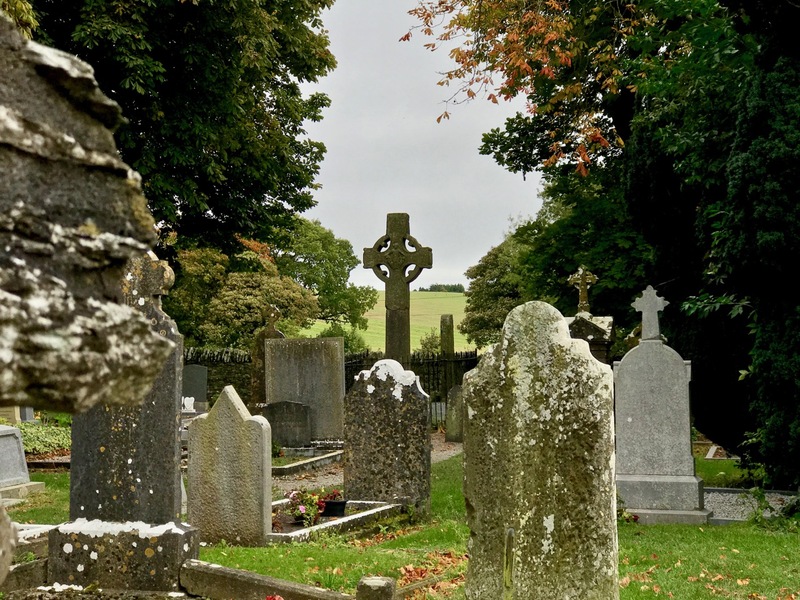 For any Irish High Cross enthusiasts (I suspect that there are many of you out there), Monasterboice in County Louth has to be on the list of ‘must see’ places. 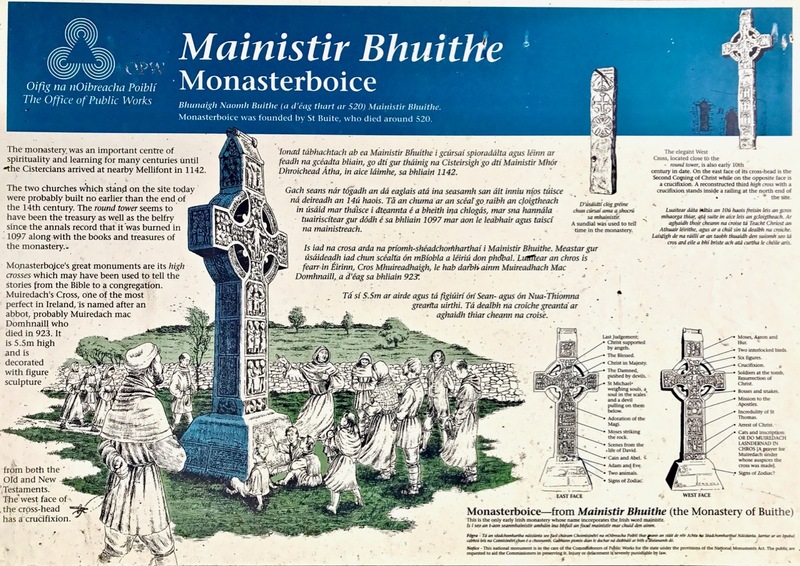 It was founded in the 5th century by Saint Buithe, a follower of St Patrick – the Irish Mainistir Bhuithe means Monastery of Buithe – and was an active and important Christian settlement through to the 12th century, when its importance was eclipsed by Mellifont. I found out that St Buithe ascended into Heaven by climbing a ladder that was lowered down to him for the purpose. 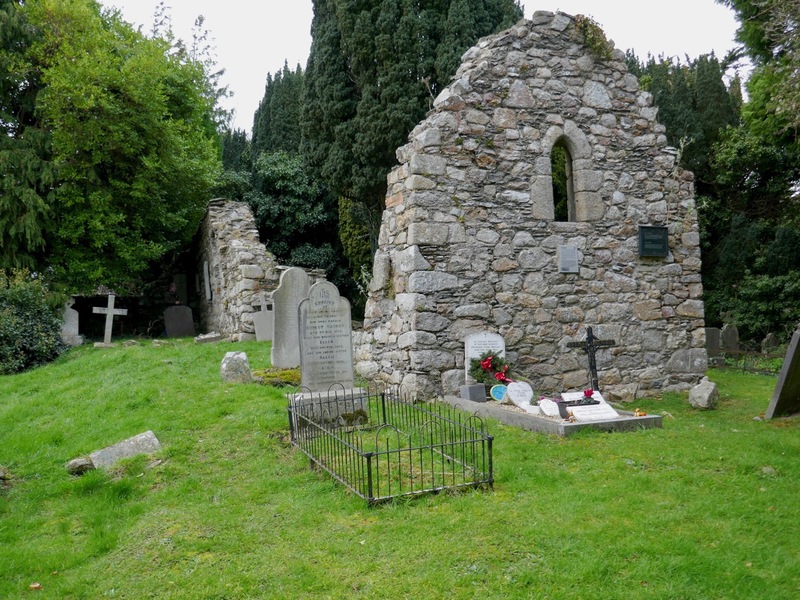 Muiredach mac Domhnaill, who died in 923, was an Abbot at Monasterboice. He is credited with commissioning the great cross, shown above. 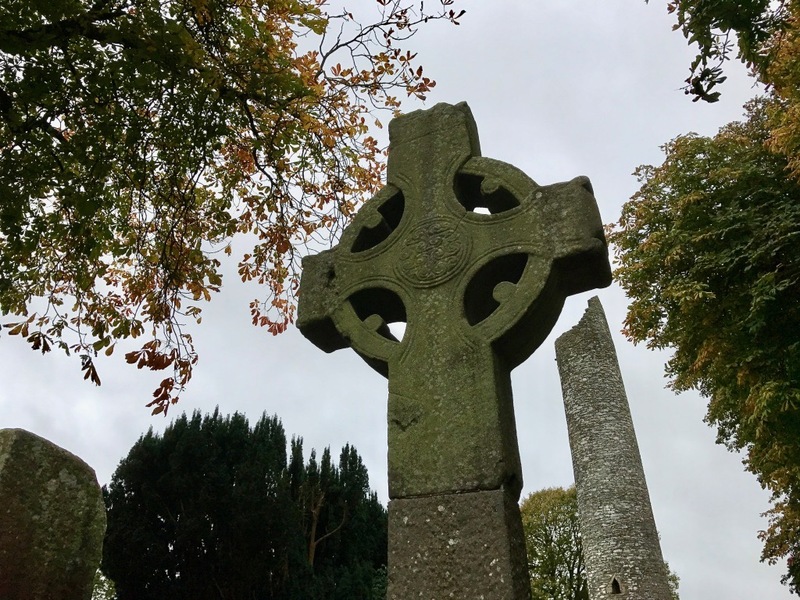 It’s not quite the tallest high cross in Ireland, but it’s said to be the finest, probably because of its stature and remarkable state of preservation. The carved panels are all legible, and the biblical stories illustrated have all been identified. 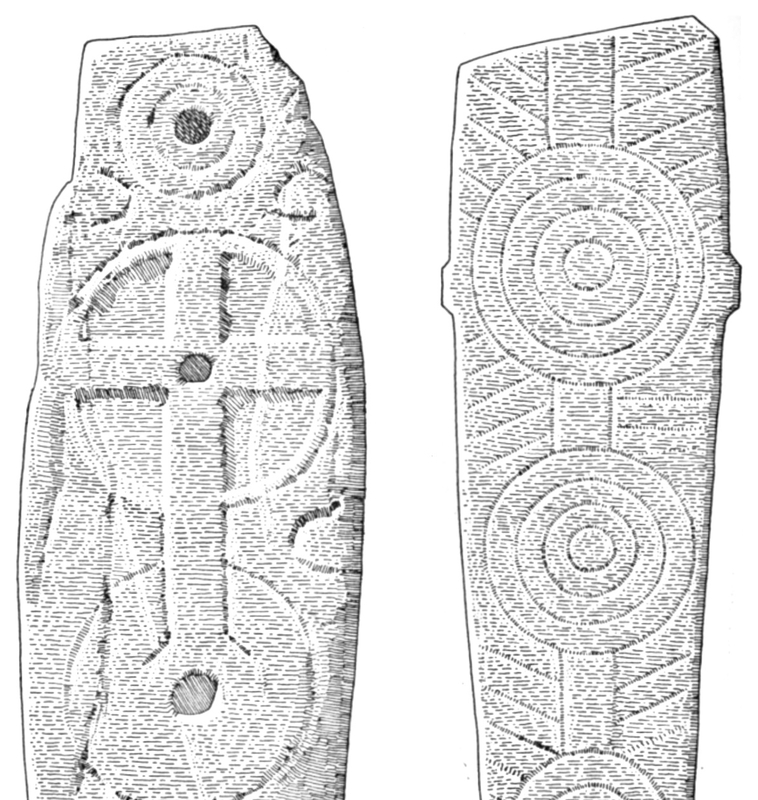 An inscription on the lower section of the cross shaft states: OR DU MUIREDACH LASNDERNAD IN CHROS – A prayer for Muiredach under whose auspices this cross was made. 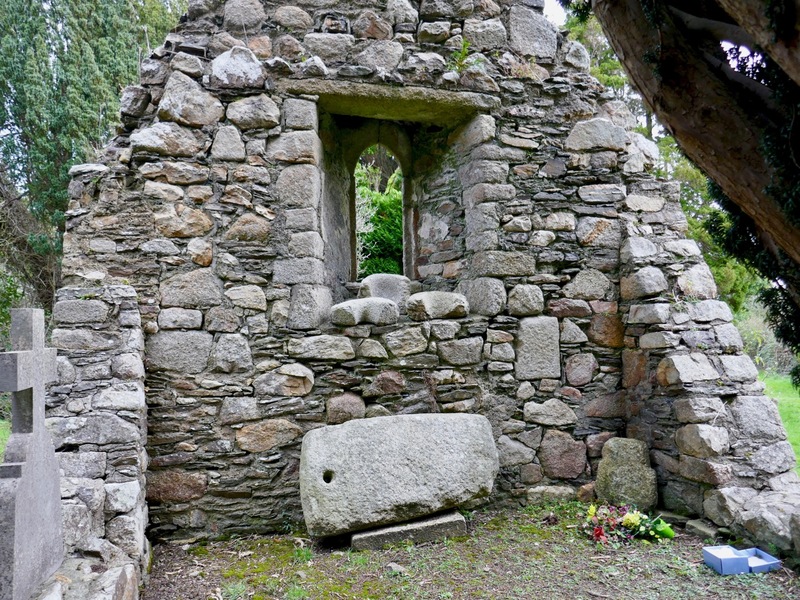 Confusingly there was also a king, Muiredach mac Cathail, who owned the lands on which the monastery was built. 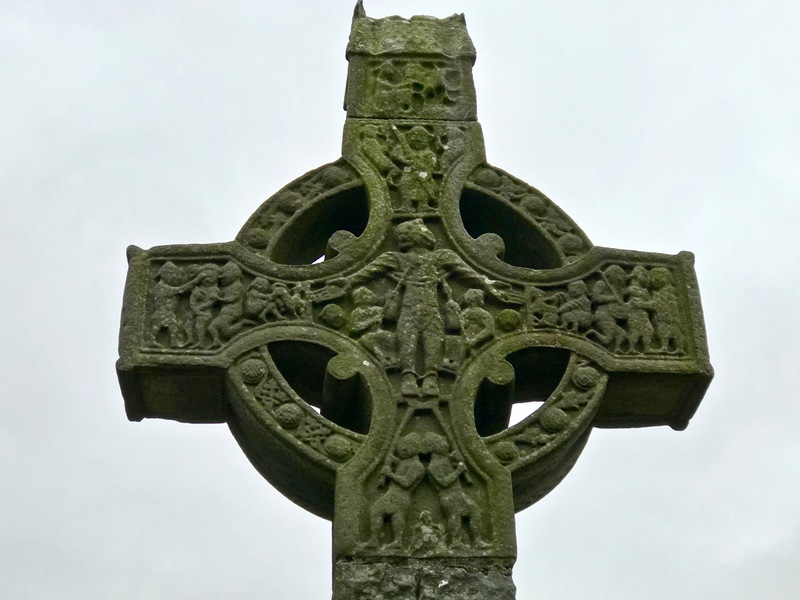 He died around 867, so it is possible that the cross was commissioned by him, or was made in commemoration of him, rather than by the Abbot. This wealth of medieval art is only part of the site’s wonders. 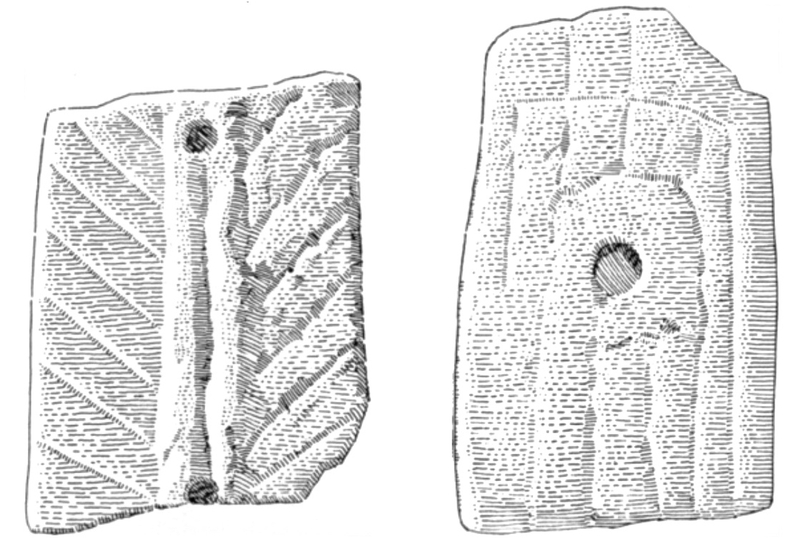 There are two more complete High Crosses, fragments of other carvings and slabs, and a round tower. 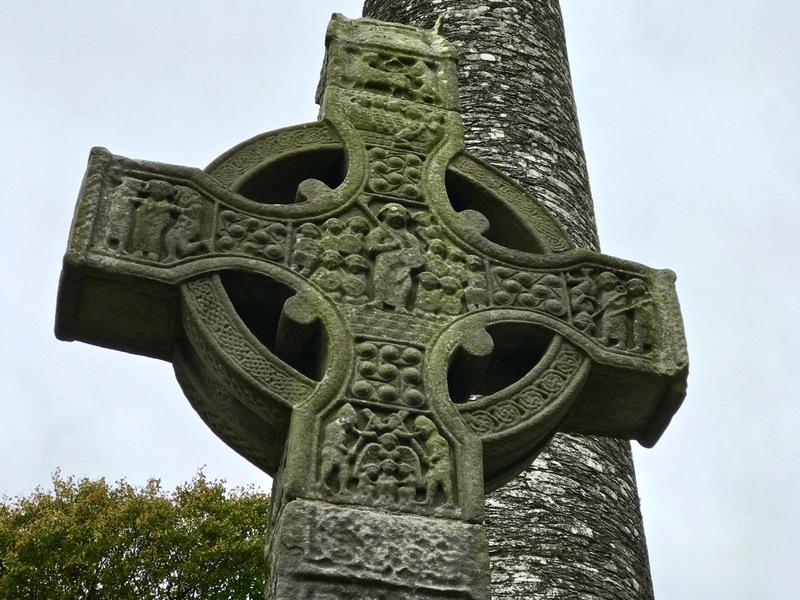 The Tall Cross or West Cross is the highest in Ireland, at nearly 7 metres. 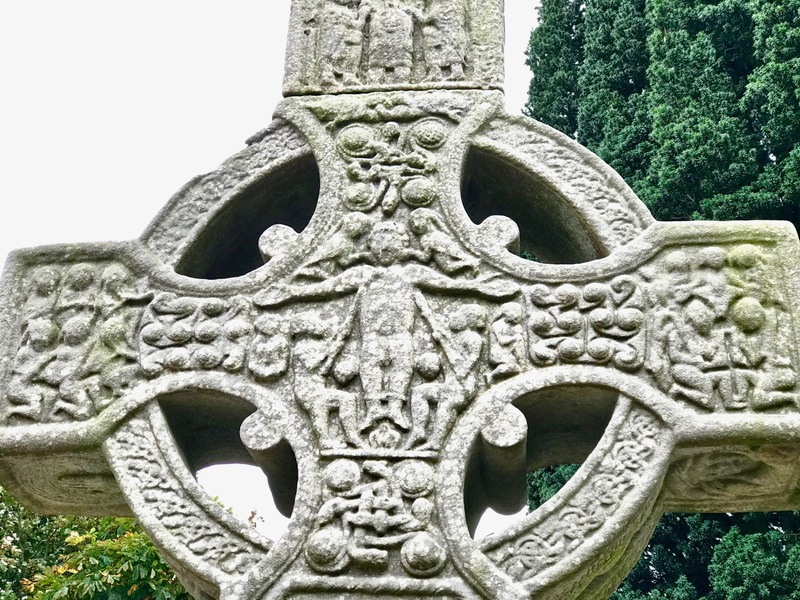 Because of its size it has the greatest number of carved panels of any Irish High Cross. 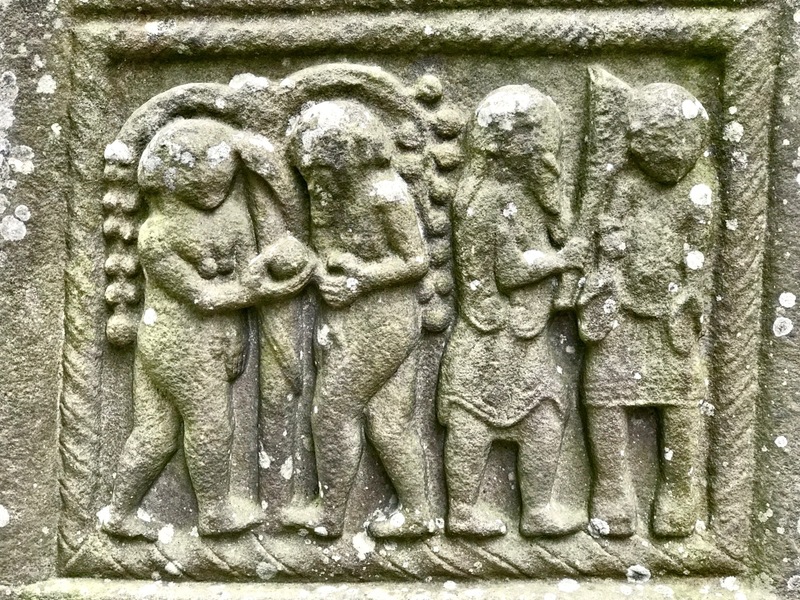 However, these panels are suffering from weathering much more than Muiredach’s Cross, and their present state must raise concerns for all the carvings at Monasterboice. 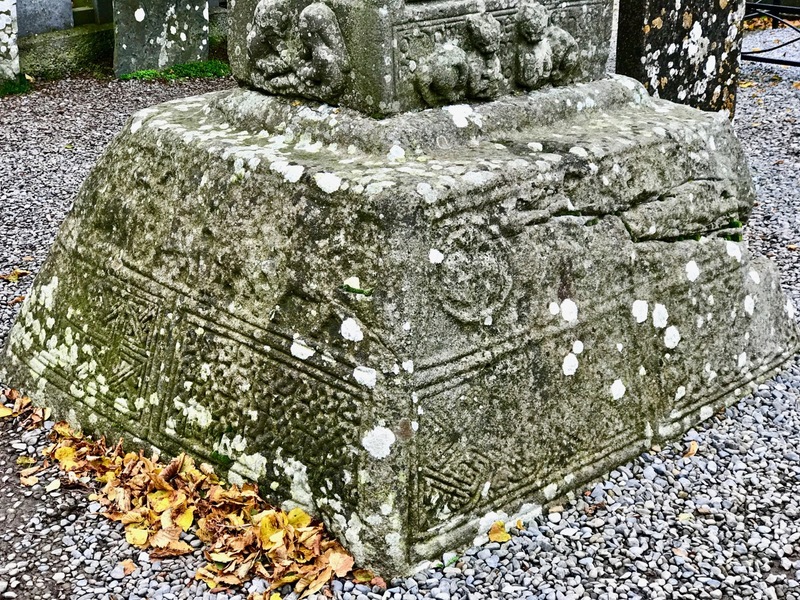 At other sites, crosses have been sheltered (Moone) or moved into buildings (Clonmacnoise, Durrow). 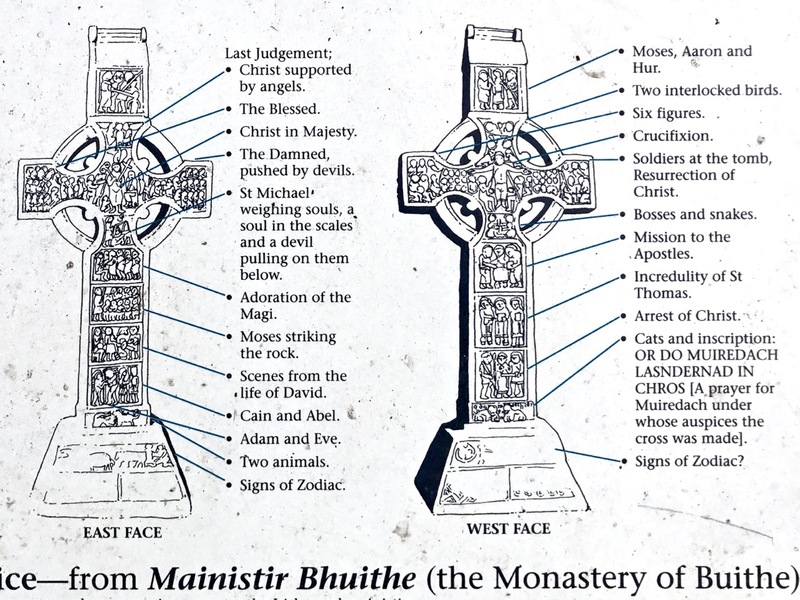 There is a third High Cross at Monasterboice, known as the North Cross. 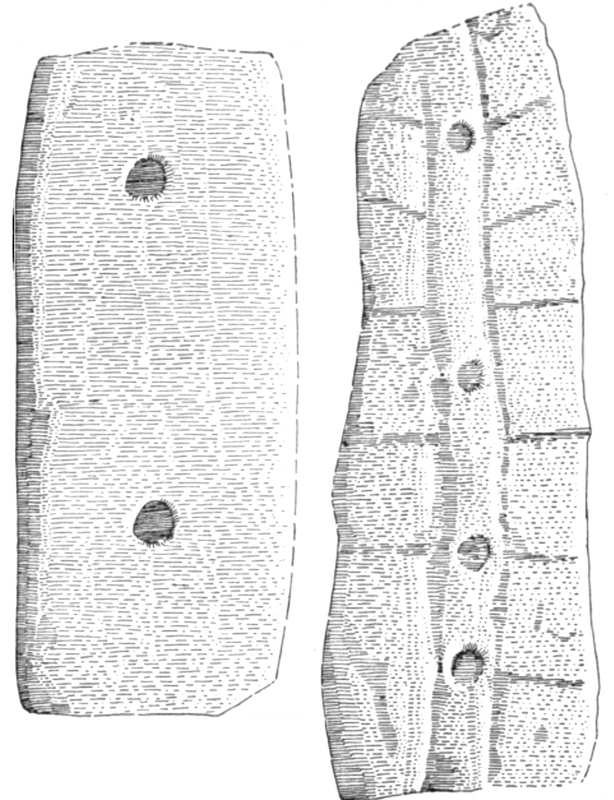 It is less spectacular, perhaps, than the large ones, and the carvings are comparatively minimal. Nevertheless, its modesty gives it a somewhat more refined character. 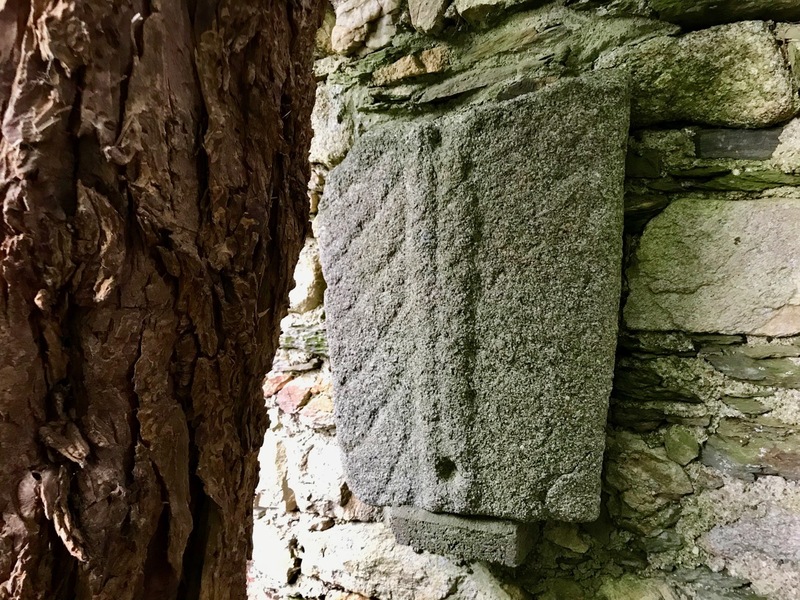 Close to the North Cross are some fragments, including part of a medieval sundial – reminiscent of the one we saw at Kilmalkedar, County Kerry, earlier this year. 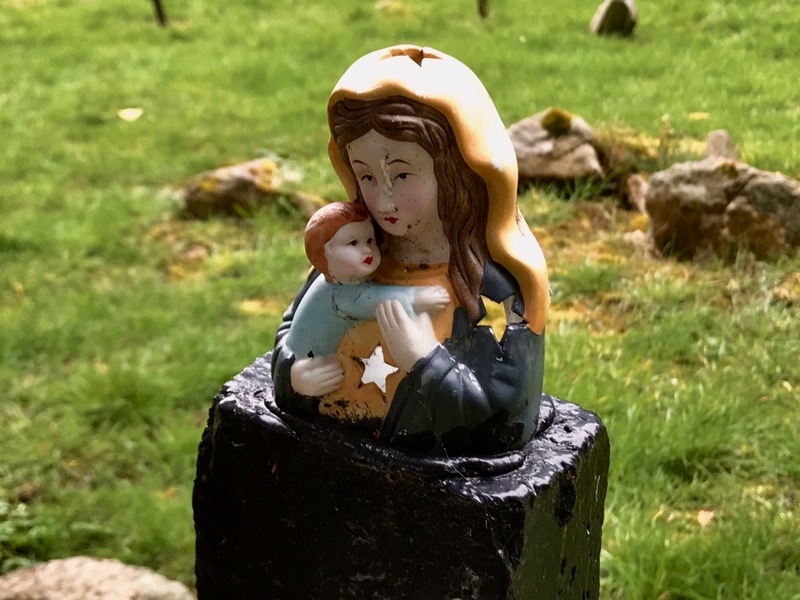 Monasterboice displays so many wonders. Yet, in some ways, it’s an uneasy site. 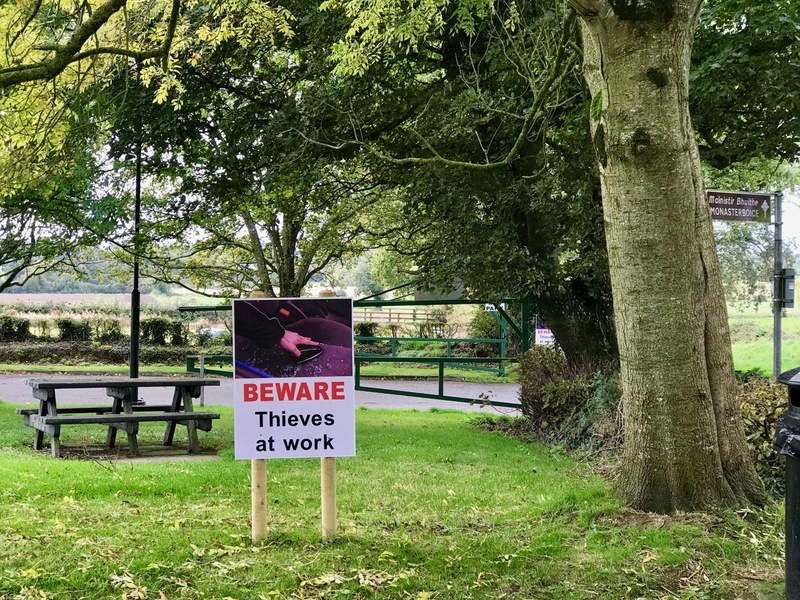 It’s probably not helpful – but perhaps essential – that the parking area a little way off is rife with warnings about thieves, and broken glass is evident. There have also been reports of vandalism against the monuments themselves – emphasising their vulnerability. The place is of major importance: during the summer season the site is attended, and guides are available. We were there in early October, when no-one was around. 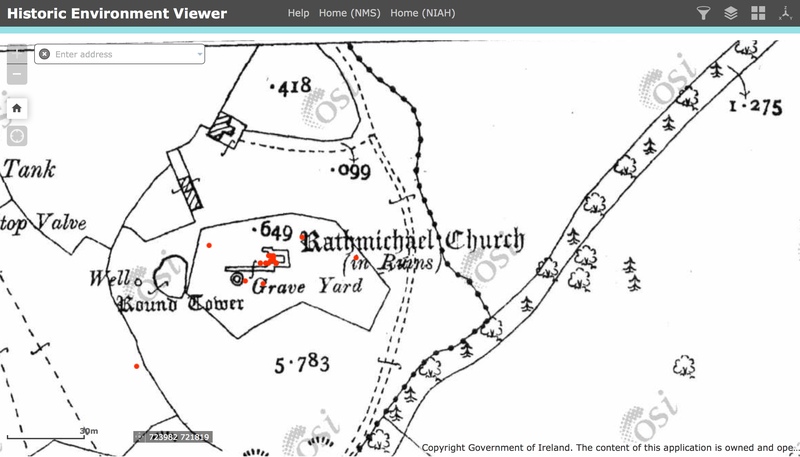 This site – and similar ones all across Ireland – are vitally important to the heritage of this country. The artefacts are irreplaceable, yet too little resource is given to protecting them – from weather and people. 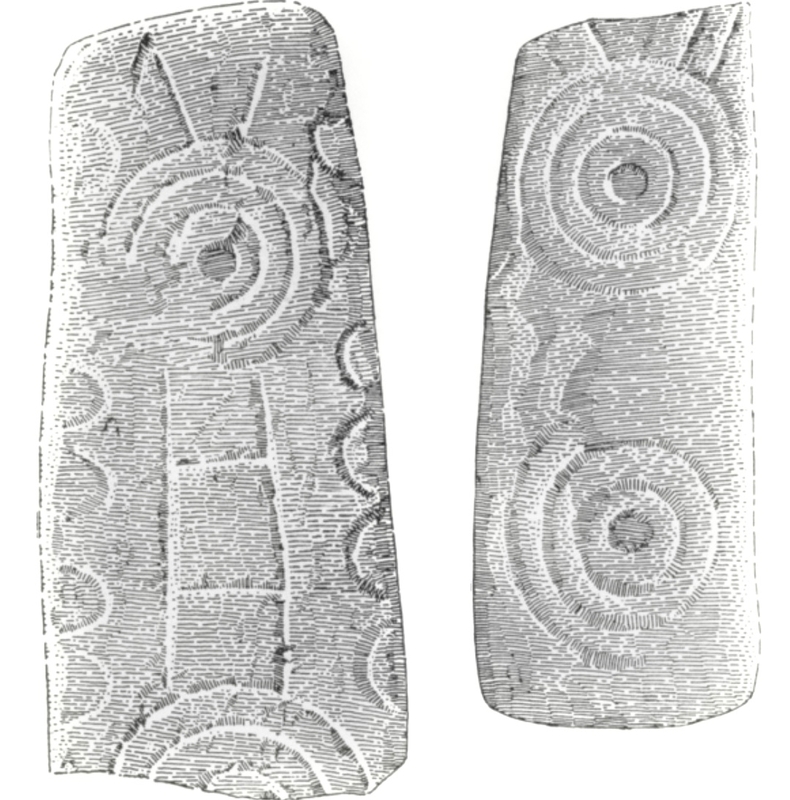 As we know from our forays into the world of Prehistoric Rock Art, stone carvings are fragile, and under-appreciated. There’s no obvious easy solution, apart from them being given higher status and priority by the empowered bodies such as the Office of Public Works. They, in turn, need to be given more support by the State, particularly in terms of funding: they do the best they can with very limited resources. 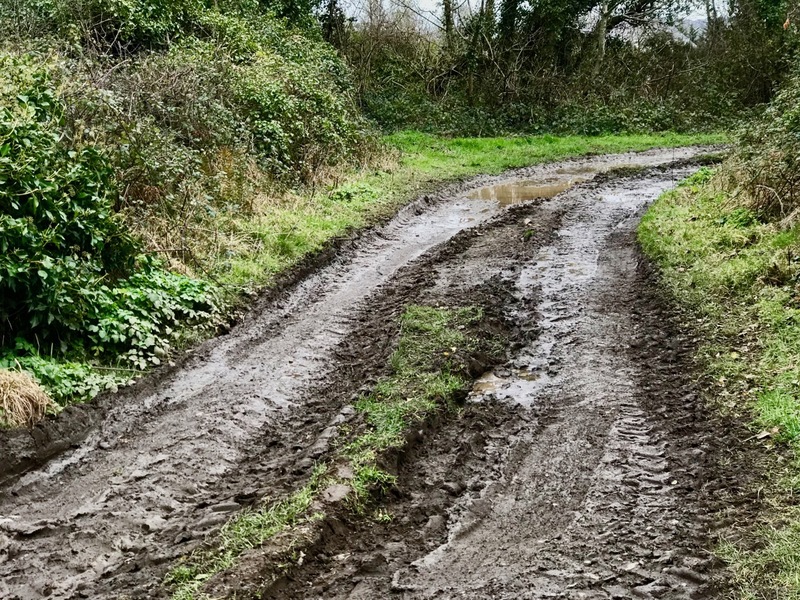 Why do I feel a little ‘guilty’ about being English while dwelling, for the moment, in Ireland? 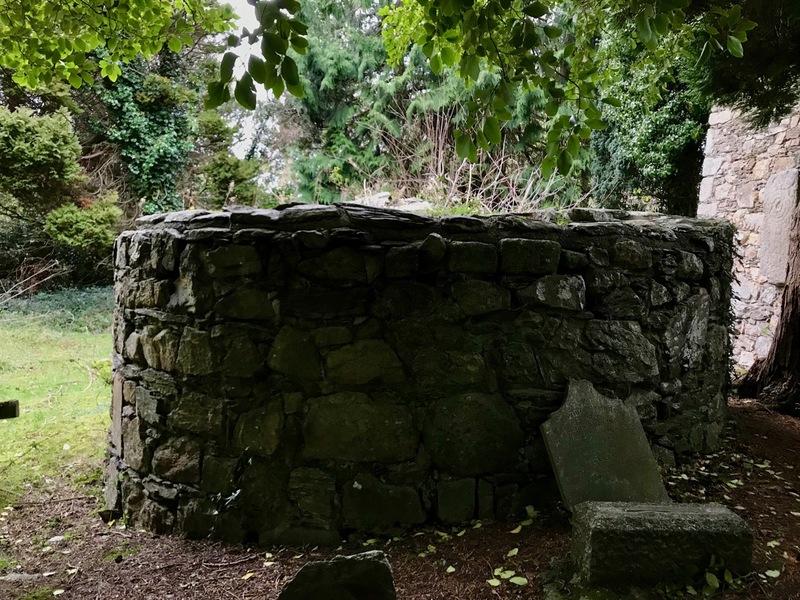 This morning I shared a car ride with a friend – Irish – so I started off our conversation by voicing this feeling and pointing out my ignorance of Irish History, having learned nothing about it during my education years. The ensuing journey then consisted of me listening to an erudite and most entertaining blow-by-blow account… Remember Aenghus, the Red Bard? 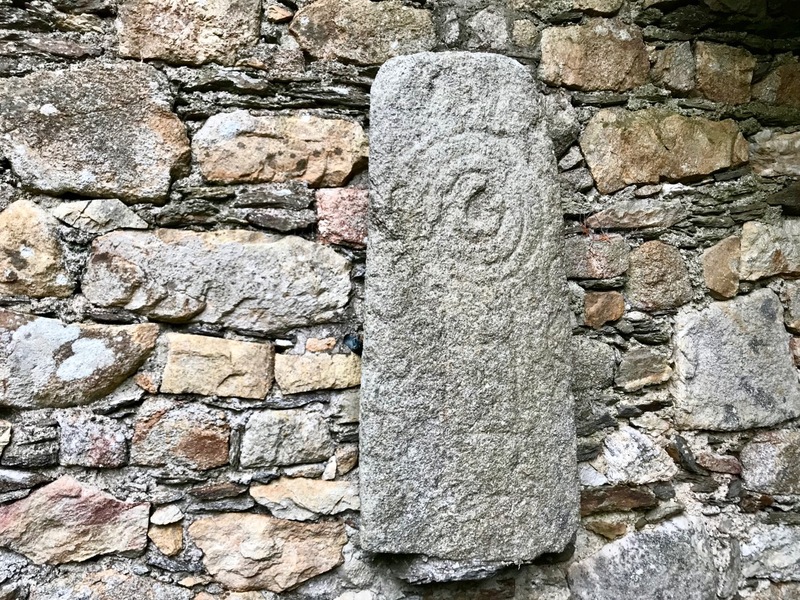 It was as though he was sitting in the car with me, recounting the history lessons of his seven year apprenticeship in the Bardic School at Dumnea. My personal induction began with the Danes. I hadn’t understood, before, that there had been a ‘special relationship’ between Ireland and Denmark, based on trade and education. 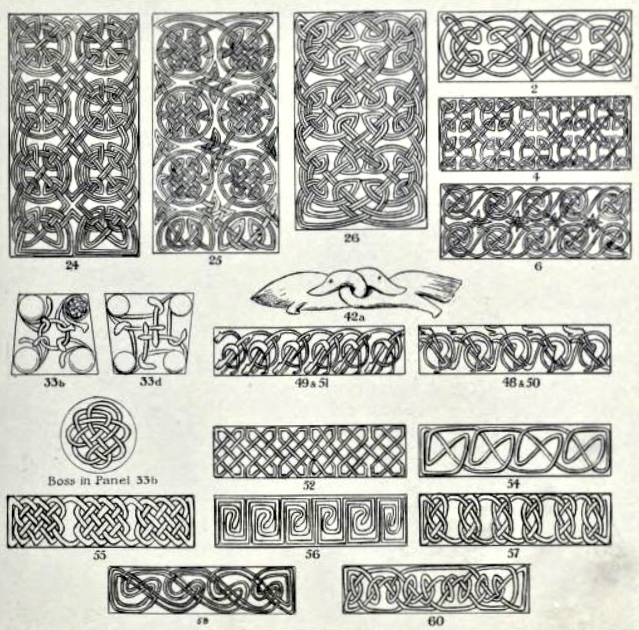 This had started in the so called Dark Ages and flourished until the time of the High King Brian Boru (c941 – 1014). I already knew about him – in connection with a harp: the Brian Boru Harp sits in Trinity College, Dublin, along with the Book of Kells. Oh – and a traditional tune: Brian Boru’s March. 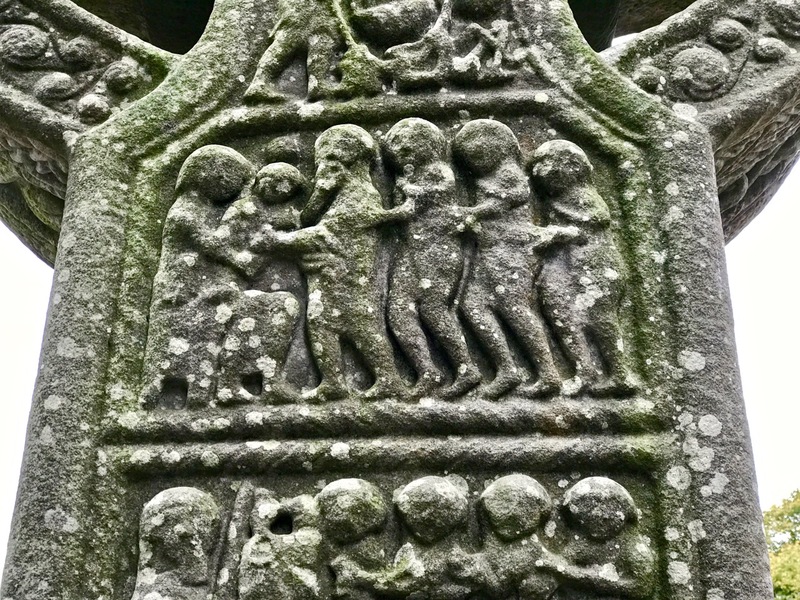 The relationship became an invasion, and the Danes were despatched by a rare coming together – under Brian Boru – of tribal kingdoms, who afterwards reverted to their more usual squabbles. Now we come to the time of the Normans – well established in England by the 12th Century – and the only English Pope: Adrian IV – who in 1155 issued a Papal Bull to Henry II of England giving him authority to invade Ireland in order to rein in the dissident church there, who were not toeing the line with Rome on a number of matters. 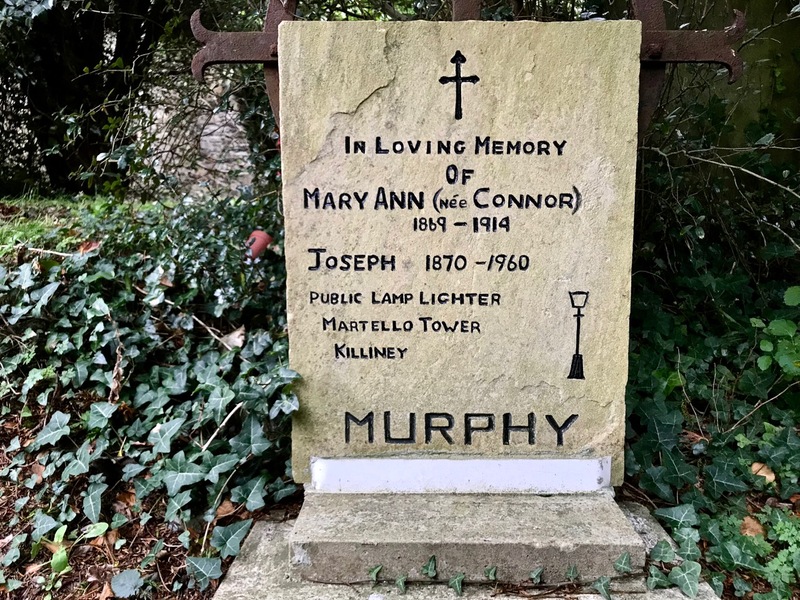 This coincided with a feud between a petty King of Connacht – Tiernan O’Rourke – and Dermot MacMurrough, the King of Leinster. 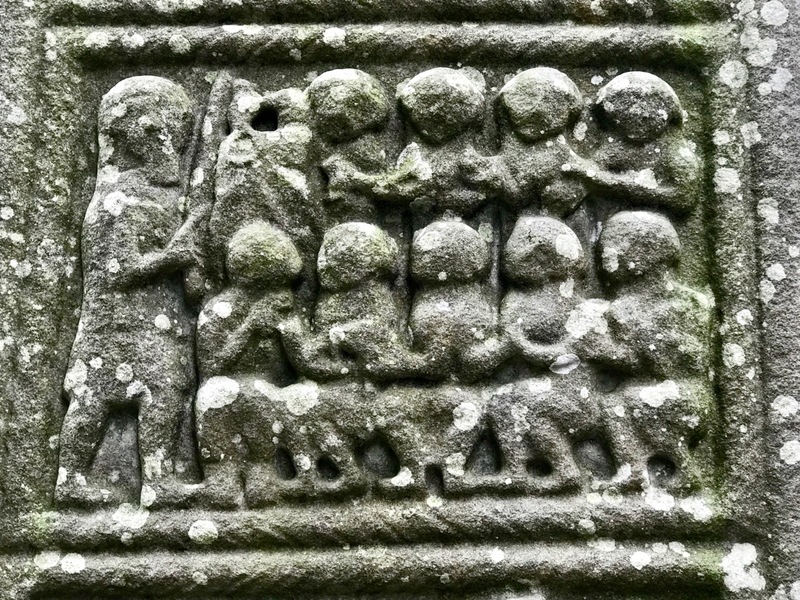 O’Rourke’s wife Derbforghaill was abducted by MacMurrough (but evidently at her own instigation, and during which, while being carried off, she provided realistic and convincing screams). MacMurrough had to flee to Wales from where he beseeched the English King to mobilise the Bull and invade Ireland. This actually suited Henry’s empire building ambitions quite well and he dispatched Strongbow (no – not the cider but the Earl of Pembroke, Richard de Clare) and the result of all this was that the Normans arrived in Ireland – where their descendants have caused disruption ever since. Of course – it’s by no means that simple, and this strand of the story will have to be amplified in a future post…. Confused? Well – I haven’t even mentioned Cromwell or William of Orange yet! But perhaps that’s better left until another time… And where does West Cork fit into this jigsaw puzzle? It seems that it was so far away from Dublin and Cork that it didn’t feel the ripples of what was going on for a long time, and local politics were largely sorted out between the O’Driscolls and the O’Mahonys (descended directly from Brian Boru) who built a line of castles along the coast and did very nicely out of charging dues from the Spanish and Portuguese fishermen who reaped an abundant harvest from the seas of those days. 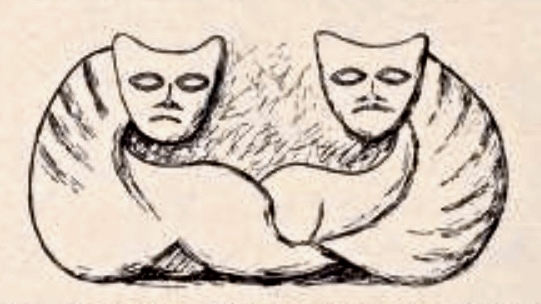 And – perhaps surprisingly – the clans built up a reputation for scholarship and knowledge of the arts and sciences. 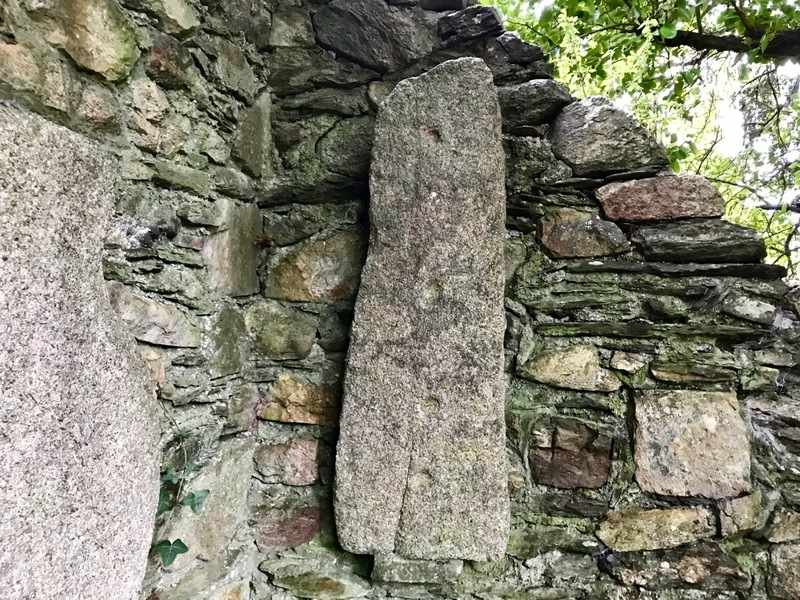 Just around the corner from Ard Glas is an actively disintegrating stone ruin, a single teetering wall: this was the home of the famous ‘Scholar Prince’ Finian O’Mahon, Chief of Rosbrin who lived in the late 15th Century and who was described then as one of the most learned men of his time – not just in Ireland but Europe and beyond. Across the water and central to our view is Kilcoe Castle – formerly an O’Driscoll stronghold: some years ago it was superbly restored and is now the home of actor Jeremy Irons. In order to prevent the ingress of damp (which seems to have been an essential feature of castle life in the Middle Ages), he has treated the walls with an external render which glows yellow, orange and gold as the sun moves round. 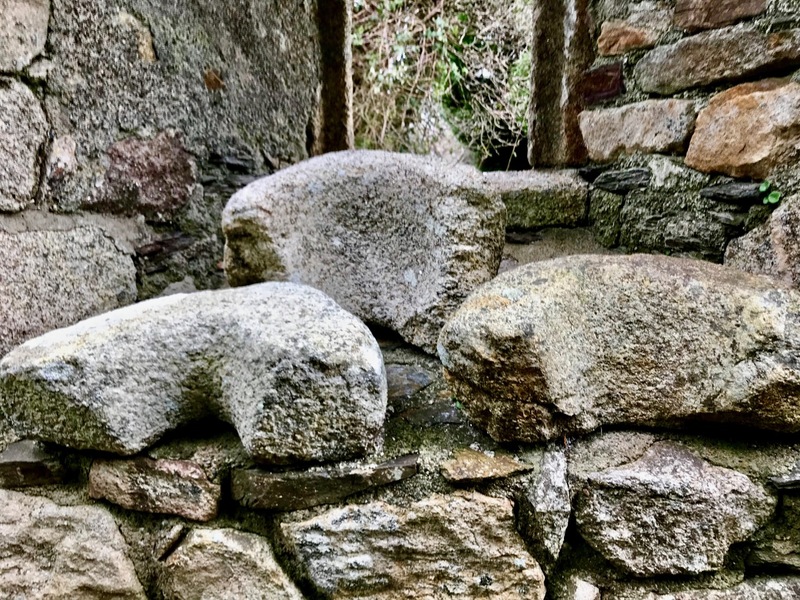 It is visually prominent in the land and seascape, and this was no doubt an essential element of all the castles in those days when Kings and clansmen had to project their status in order to shore up their often precarious positions in society.